Pro life tatics haven’t changed from 1983. 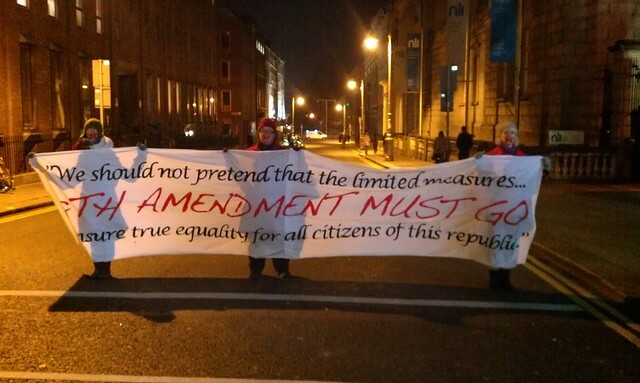 Those who opposed the 8th amendment were accused of being pro abortion and running a campaign for abortion when they were questioning the flawed nature of the 8th amendment. 1968 Ballfermot women speak out about being on the pill. In 1968 contraceptives were still illegal in Ireland, this didn’t change until the mid 80s. Women were often told after having anything between 8 to 12 children to not have any more by drs but would be told by priests they had to do their duty and it was not possible to press charges if your husband raped you. The contraceptive pill could how ever be prescribed for other reasons. But every pill taken was deemed a mortal sin and if a woman was known to be on the pill she could be refused communion and even barred from the church. This film was recorded in Ballyfermot and two women speak about their large families and the moral and legal dilemma they faced in order to take the contraceptive pill for the sake of their health, their lives and their families. My Nana was one of those women rearing 10 children in a small 3 bedroom house. When one of the neighbors in confession admitted to do doing her duties to her husband the priest ran her out of the church and told her not to darken the door until she had preformed them. My grandmother with the rest of the women’s solidarity in the parish boycotted the priest until he was moved. Ireland has come a long way in shrugging off the shackles imposed on it but the roman catholic church which has caused such suffering, but we still have a long way to go, as most of our schools and hospitals are still controlled by it.